There's something special about skiing in Yellowstone. The crowds of summer are gone; the mountains are quiet, cold, and covered in snow; there's a solace that permeates the chill of Montana's winter--it's an experience like no other. From its menagerie of wildlife (bison, elk, wolves, and lynx, to list a few) to its raw, wild mountain landscapes, Yellowstone should be on every skiers bucket list. Big Sky Backcountry Guides offers tours in every part of the park, and can accommodate any skill level or interest. From scenic tours along corniced creek bottoms to powder runs on some the park's most iconic peaks, there's something for everyone. Let us take you skiing and show you what Yellowstone has to offer! Details and Rates are at the bottom of the page. Ski Yellowstone Park, just minutes from Big Sky! 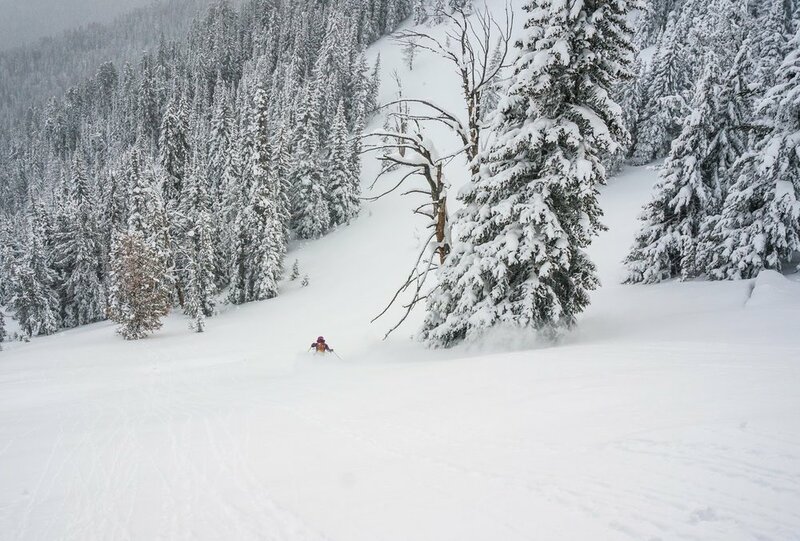 Located just minutes from Big Sky in beautiful Gallatin Canyon, this diverse area of Yellowstone offers easy access to ideal ski touring terrain and copious snowfall. 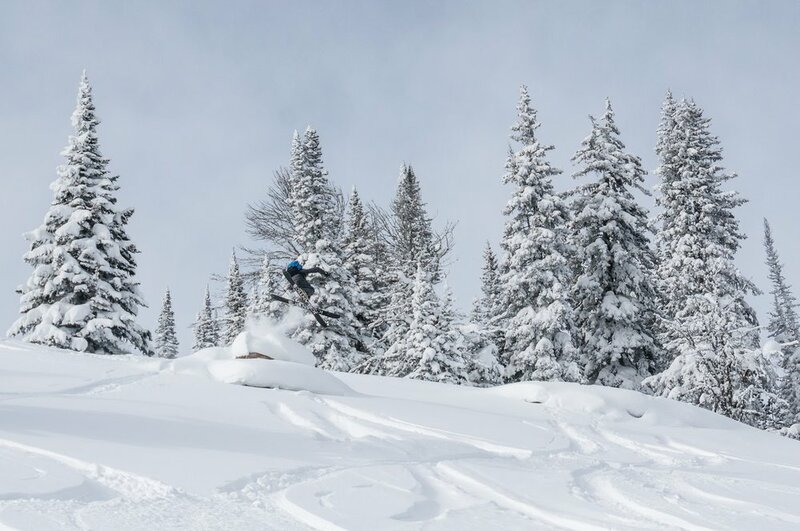 Whether you desire wild, scenic ski tours through gentle meadows, or challenging summits with amazing powder turns, there is something for everyone--all within easy striking distance of Big Sky and Bozeman. 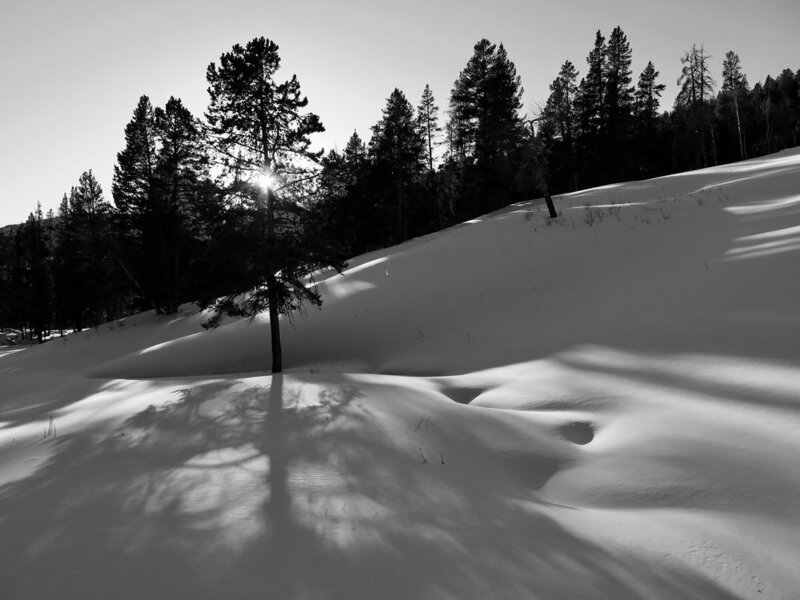 If pristine powder isn't enough, moose, wolves, lynx and wolverine call this part of the park home--maybe you'll cacth a glimpse. Go exploring with Big Sky Backcountry Guides! Ski amongst Yellowstone's wildest inhabitants. From Silvergate and the NE entrance to Yellowstone, adventure calls in every direction. Ski amongst herds of bison and steaming thermal features in the iconoc Lamar Valley. Watch wolves from across braided, icy stream channels. Ski deep, wilderness powder on striking peaks, far from the crowds. This is a special part of the park, as full of history and lore as it is mountains and snow. For Silvergate/NE Entrance trips, there is a $125/day overnight charge due to distance from Bozeman/Big Sky. Please make reservations at least three days in advance--we are a small company with limited guides on staff. To ensure availability, reserve early! No backcountry experience necessary; intermediate to advanced downhill ski ability and good fitness required for AT/Telemark/Splitboard trips. Alpine touring, telemark, or splitboard equipment (rentals available at Grizzly Outfitters in Big Sky, World Boards and Chalet Sports in Bozeman). Big Sky backcountry powder skiing! Prices are person, per day with a maximum 5:1 guide ratio. Our highly-trained and experienced guides are all professional members of the American Avalanche Association, and possess Wilderness First Responder or EMT medical certifications. Lead guides are trained by the American Mountain Guide Association (AMGA). Meet them HERE. More than 5 requires a second guide at the same rates. Trips must be paid in full at the time of reservation. An $80 administrative fee will be assessed to all refunds. Payments may be made via MasterCard, Visa, or check. Credit Card payments are subject to a 3% processing fee. If a cancellation is made more than 30 days before the activity, you will be credited towards another BSBG program if used within a year. There are no refunds for cancellations made less than 30 days before your program. Unfortunately, due to the time-sensitive nature of our business, and the difficulty in re-booking a trip close to departure, we cannot make exceptions to this policy. BSBG reserves the right to cancel a trip due to lack of enrollment. In such a case, a full refund is given; however, BSBG is not responsible for any additional expenses incurred in preparing for the program (i.e., airline tickets, equipment purchase or rental, lodging and other travel related expenses). No refunds will be issued for trips affected by acts of nature such as flooding, fire, or extreme blizzard conditions. These occur naturally in mountain environments and are beyond our control. If the safety of our guests is in question, BSBG reserves the right to relocate or reschedule a trip. If no arrangements can be reached to relocate or reschedule a trip, you will be credited towards another BSBG program if used within a year.